Today is my day to host the Papertrey Paper Dolls challenge #24! Everywhere I look lately it seems that I see banners somewhere and I have to say that I totally LOVE them! I love the different shapes and sizes and the different colors! So, that is what inspired this challenge! My challenge is to create a card using PTI products that you have and include an "out of the box" banner somewhere on your project! What is an "out of the box" banner? It is a banner that you uniquely create, thinking outside the box, with something that is not originally designed to be a banner! So, take a look at your stamps in a new way! What can you pull out to use as a banner? I used the Beautiful Blossoms set and coordinating die to create this banner. I die cut the shape, stamped it and then cut it out. Below is a quick tutorial to show you how I did it. Die cut & stamped the blossom flower using the largest flower. What you have left is a little piece to make a banner with. I hope you choose to play along (everyone is welcome to play)! You'll have 3 weeks to enter your card on the link on the Paper Dolls blog. I know that this might be a bit of a challenge, but I can't wait to see what all of your creative minds come up with! And, if you want to copy a banner that you have seen before, feel free to do so, it doesn't have to be your unique idea! I've also included links to two other cards using this idea to help you get started! It is starting to feel like Fall around here! The temperatures are beautiful! I love it! 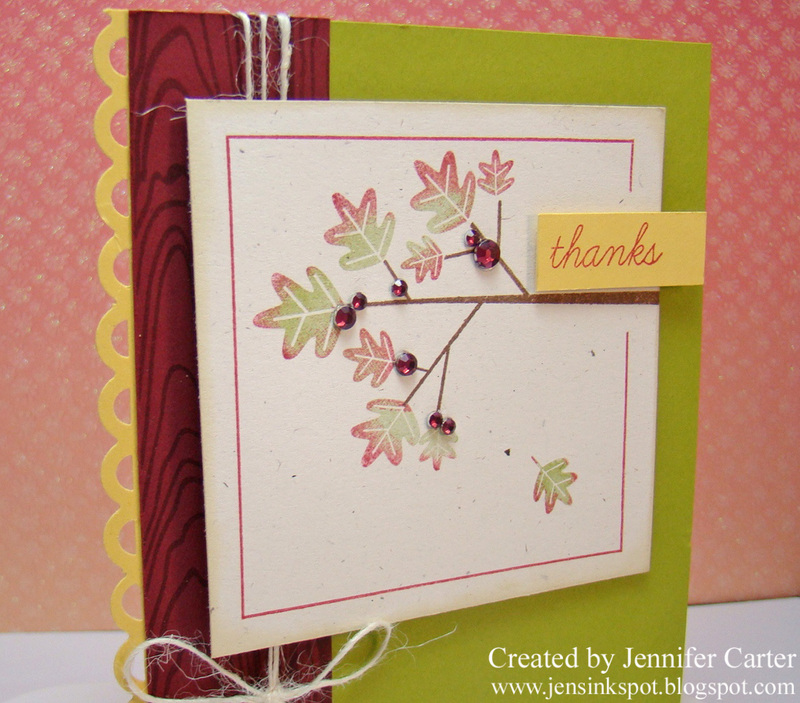 That made me want to create a Fall card and I found several challenges that fit that desire perfectly! 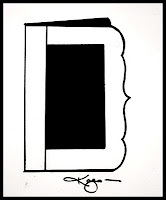 This card is for the 2 Sketches 4 You challenge (my first time participating in this one). 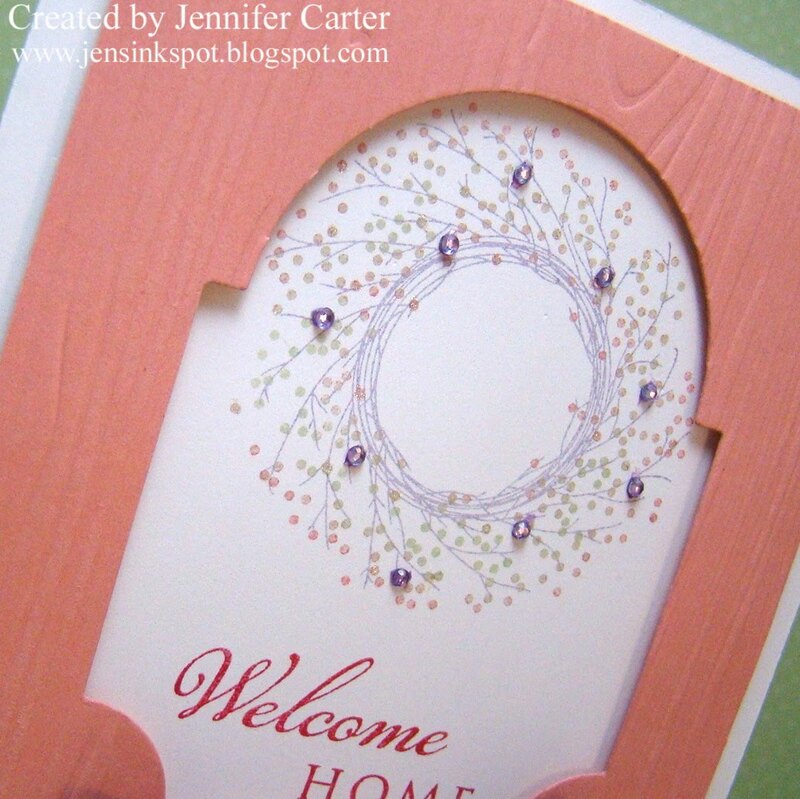 The challenge was to use the sketch with a decorative border. I chose to put my border on the opposite side than what the sketch showed. The colors were based on Wplus9's color challenge to use yellow, scarlet, green & white. And. last but certainly not least, this card also fits the Papertrey Paper Dolls challenge that Cecilia hosted to make a card inspired by fall! I love how the rhinestones on this card shine! Fall makes me think of football, pumpkin patches, corn mazes, caramel apples, cappuccino, beautiful trees with leaves FULL of color, etc... All things I enjoy (well, football SOMETIMES, LOL!)! What do you enjoy the most about Fall? Thank you for stopping by today! You are all the greatest! Welcome to September's Papertrey Ink blog hop! "One of the most fun things about this hobby is the people you meet, whether in person or online, and the things you learn from them. Now is your chance to show off any skills you might have learned from a fellow stamper, and perhaps even give them a little shout out to thank them for the inspiration they have provided. Create a project using one of your favorite learned skills!" 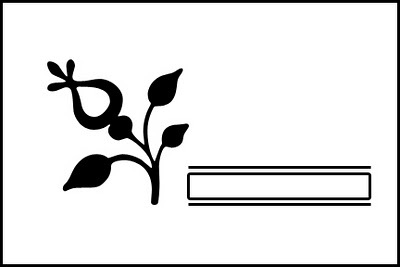 This one had me stumped for a while. Then, I decided to look through the file on my computer where I had pictures of some of my first cards saved. Wow, that was a humbling trip down memory lane! LOL!! But, I found what I was going to dedicate this post to! 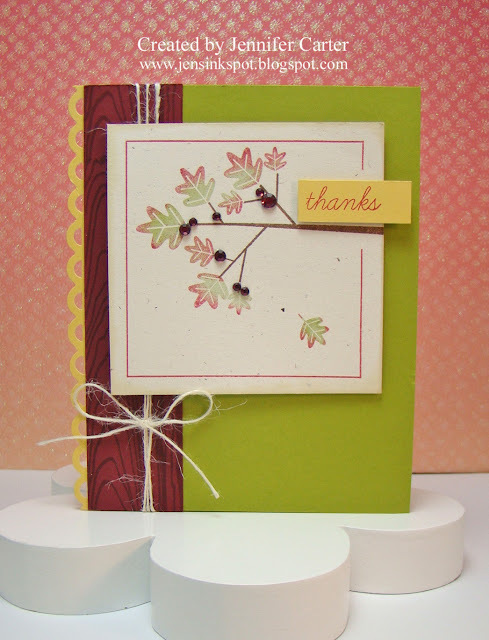 Natasha Trupp has a style of stamping that I've always admired. I love her Clean & Simple style and her blog has been in my Google Reader/Feeds since the time I really got into stamping! The post that this card is based off of is clear back from 2006 but it was a post that has stuck with me! 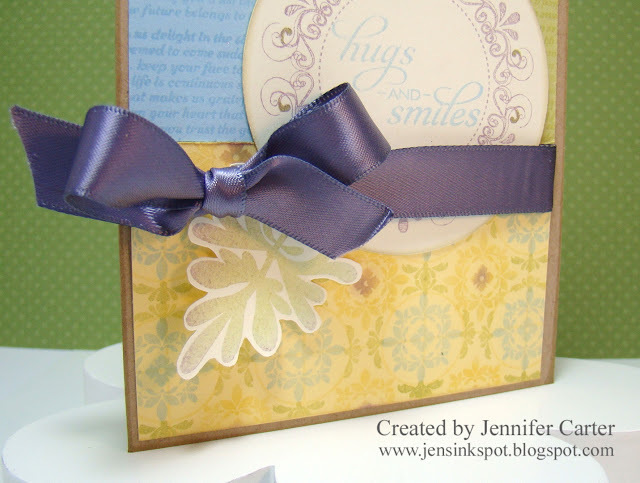 On her card in this post she made her own chipboard buttons! Well, I am a sucker for anything with buttons, so I decided to recreate the buttons that she made then with a slightly different take today. I used the snowflake dies that match PTI's new set, "Peace Be Still" and die cut several snowflakes out of chipboard and then die cut them again on cardstock. Then, I stamped the snowflake image and glued the cardstock to the matching chipboard shapes. Then, I took glue and put it on top of the snowflake and poured glitter to cover the entire image. After that was dry, I took crystal lacquer and put a generous amount on top of the glitter and used a paint brush to move the lacquer over the entire snowflake. By doing all this, the snowflakes are glittery and shiny and the glitter is sealed so it won't easily come off. Instead of making them into "buttons" I wanted to "hang" the snowflakes from twine. I wasn't really satisfied with how that looked so I added the ribbon instead. 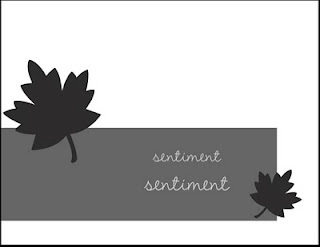 Also, did you notice how well the sentiment fit inside the new "framed" set? I love when I make those kind of fun discoveries! Be sure to check out Natasha's blog, Palmtrees & Pogosticks! She also has a challenge blog that I enjoy visiting & playing along with when I can called Clean & Simple! 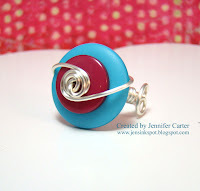 Be sure to check out the other blog hop participants via the link on Nichole's blog! Blog posts can be added until 10:00 PM Central Time tonight so be sure to check for an updated list! One of my most favorite sets that Papertrey Ink released this month is a "Wreath for all Seasons". This one has so many fun possibilities! I knew that this had to be the first set from my order that I played with! I kind of envisioned this as a wreath hanging on a door. 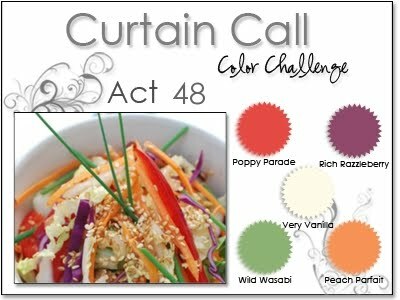 I took the colors from this week's Curtain Call Color Challenge. 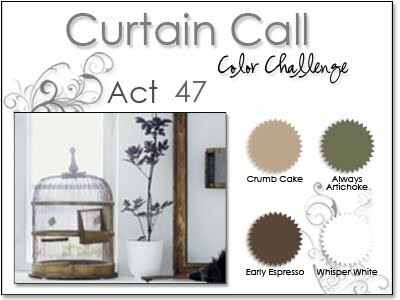 They were such a great group of colors and I loved having them for inspiration! I work so much better that way sometimes! I colored some clear rhinestones with a purple copic and added them randomly around my wreath. I love the extra little pop that they give to the card. Thanks so much for stopping by!! I hope you enjoyed the card! I knew when I saw this challenge that I would either make a nature type card or a coffee card. I went with nature. I used my Spica clear glitter pen again on some random leaves to add interest. It is hard to see, but I hope that you can see at least a few of the leaves are sparkly. Thanks for stopping by again today!!! You are all the best!! Have a great weekend!! I'm heading to a craft fair tomorrow (at least one) and I'm excited about that! Here is another Papertrey Paper Dolls Challenge that I needed to complete! This one is challenge #20 and it was hosted by Laurie and she challenged us to make anything with a school theme in honor of the kiddos/teachers going back to school. I based this card off another "Got Sketch" sketch that I loved. This one is an older one from July, #101 and you can view it here. Isn't this a fun layout? I'm not always the greatest at combining patterned papers but I really thought that these patterns were fun and worked together to create just the right school themed card. I tied the button with baker's twine that matches Hawaiian Shores. I have this for sale in my Etsy shop too! You can check it out here. You get 10 yards for $2.00! We'd love to have you play along with us over on the Papertrey Paper Dolls blog!! Everyone is always welcome to join us!! 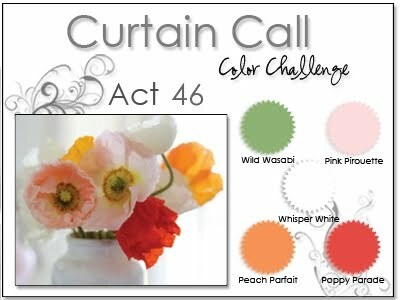 Amy is hosting the Papertrey Paper Dolls Challenge this week. I am behind on these, so I'm trying to get caught up but first wanted to start with this one. Amy challenged us to create a card that is: 1). CAS (Clean and Simple), 2). has lots of white space & 3). has a pop of color. I am showing you this photo so that you can hopefully see the glitter on the edges of the petals from the Copic Spica Glitter pen which I love!! Instead of glitter, this pen has tiny pieces of glass in it that make a wonderful sparkle! 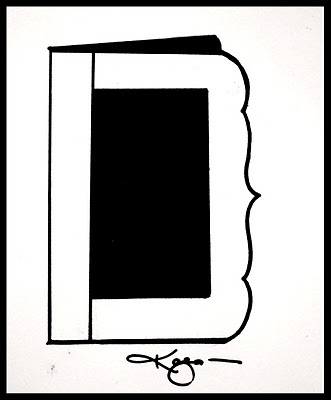 This card was based on the Card Positioning Systems Sketch #184 shown below. Thanks for taking the time to stop by! I hope you have a wonderful day! I found a fun, fun sketch this week and had to play along! This one is from "Got Sketch". If you would like to see the sketch, you can go here. If I read it correctly, I can't post the sketch on my blog. But, be sure to check it out, it is so fun! Look at that impression plate!! It matches the sketch design perfectly! Here is a closeup of the ring. Yummy, yummy colors! 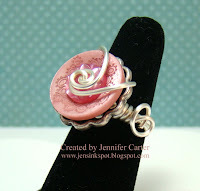 If you are interested in purchasing it, you can find it in my Esty shop, Jen's Ink Spot. Thank you for stopping by!! I hope you enjoyed today's card! Hey all!! I hope you are having a great day!! I wanted to share with you a set of cards I made this week. I wanted to keep them very simple as to not distract from the message, all focused on the cross. I combined PTI's "Everyday Blessings" stamp set and a couple of Scripture verses from Verve stamps. These came together so fast and were super simple to put together! This last card has a verse on it that I just love!! The stamp is from Verve and it is only $3! The verse is such a wonderful verse and there is a song by a local singer (those of you who listen to American Family Radio may be familiar with her), Ginger Millermon, and she sings a song based on this verse. If you'd like to listen to it, I've attached it to this post! I hope you are blessed and encouraged by it! Thank you so much for stopping by today!! I hope you have a great weekend! After I orginally posted this, I decided to add one more video. If you would like to see the story of the hard path that God has taken Ginger and her family down, this next video tells their story. It is worth the time it takes to watch it and I pray that each who watch it will be touched! This card is a totally different style for me. In fact, I'm not really quite sure how it turned out to look like this! LOL!! 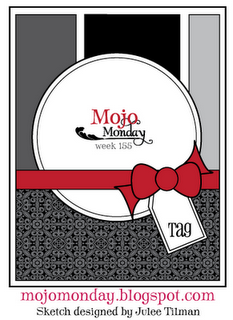 I based the sketch off of the Mojo Monday #155 sketch. To create the bottom portion, I stamped an image from Guide Lines 2 in Spring Rain ink on Lemon Tart cardstock. Then, I stamped the little circle leaf bracket-like images in Spring Moss. Then, I stamped the same image I stamped in Spring Rain earlier, with VersaMark ink in the blank spaces and took yellow Pebbles Shimmer chalk and rubbed it over the image. Then, I took some purple chalk and rubbed it over the center of the images. It makes kind of a vintagey looking paper. Thank you for stopping by! I hope you have a great day!! Hi everyone!! My friend Laurie and I were talking the other day about challenge blogs and I told her that I needed to try some others. She recommended Curtain Call so when I checked it out, I found that they have a fun color challenge up this week. I was trying to combine this with another sketch challenge, but it just wasn't working out so I abandoned the sketch and went with just the colors. Here is my card based on this challenge. There is peach (melon berry) in the flowers too but it is hard to tell since I added red to the outsides. I love that PTI frame from Tiny Treats: Halloween! 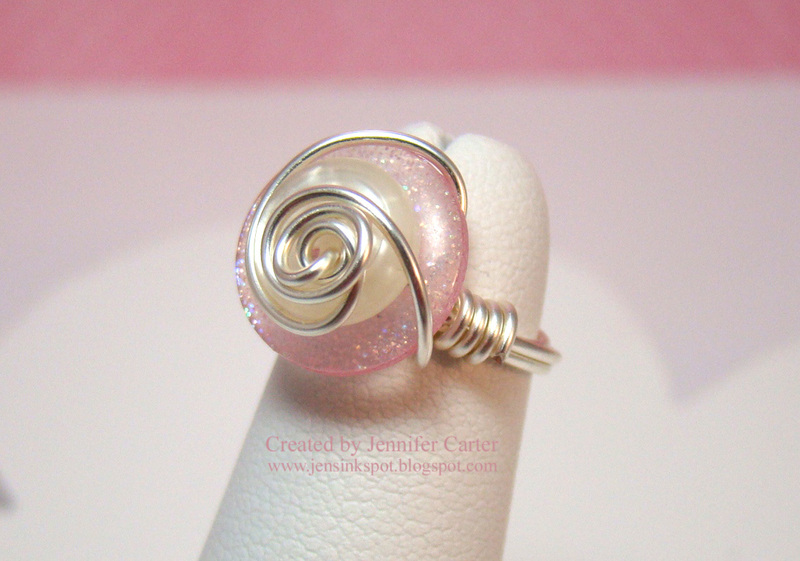 I really like it stamped in a soft color! Nancy, from the PTI forum, was kind enough to sell me just the frame as I didn't really want the rest of the set. Isn't she wonderful!! To get the ribbon around the card, I punched a hole under the main image circle and ran my ribbon through that hole (going behind the main circle image) and also punched a hole in the frame on the left hand side and ran the other side of the ribbon up through that. Then, I tied the bow. Thanks for stopping by! I hope you enjoyed the card today!! Have a great day! Ok, so enough sap!! On to the card! I have to admit that I struggle with masculine cards. This one looks a little too juvenile for a grown man but he is a kid at heart so maybe he'll still appreciate it! LOL!! I used the My Favorite Things banner die to make the banner and also to make the party hat. After I cut out the pieces the party hat just seemed fitting! This card is based on The Clean & Simple Blog's sketch #106. Thanks so much for stopping by!! It means a lot to me!! Have a wonderful holiday!! Hi everyone! I'm back today with a couple of Papertrey Paper Dolls Challenges! I combined two this time. I'm doing Anika's challenge #18 to find inspiration from a food container or wrapper. We could use the colors, layout or another design element from the packaging. And, I'm also doing Michelle's challenge #19 to make a card or project using 1) a stamp that has never been inked and 2) a product that is brand new and never been used. My food wrapper that I used for inspiration was the rice package. This was a challenge, but it stretched me so that was good! The new stamp I used that I hadn't inked up was the stem and dots from "Rustic Branches" and also I don't think that I've used that particular scripture verse before either from "Everyday Blessings". The product that I hadn't used before was the Moroccan Motifs Impression Plate. Thanks for stopping by! If you'd like to participate in any of the Papertrey Paper Doll Challenges, please visit our blog! We'd love to have you play along!